Up until recently, I had been printing on a makeshift table cobbled together from an Ikea closet door, and 2 too-tall kitchen cabinets. As we all know, most Ikea furniture is sawdust, held together by mostly cardboard and veneers. Don’t get me wrong, I love me some Ikea, but most of their ‘affordable’ pieces are not suitable for heavy use. 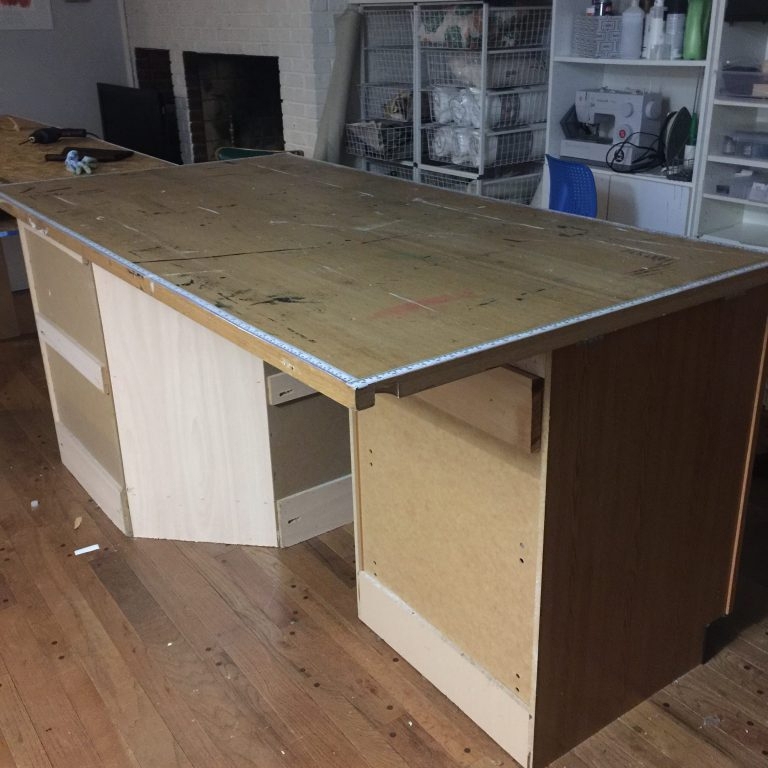 This cabinet rig-up situation was the latest in my line of attempts at making that slab door work as a table top. The rig-up worked okay for a few months, the height, the massive waste of space and clunky arrangement really started bothering me. Plus it was ugly. Its time was up. 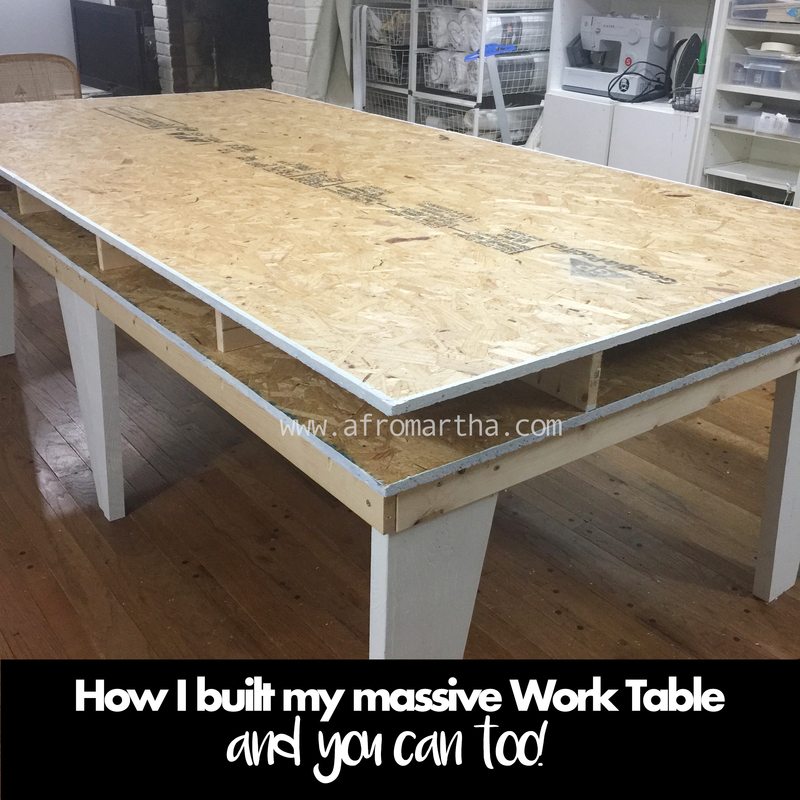 I had been pushing off building the table I really wanted, because well, I’d have to build it. I love building things out of wood, however I don’t do it more often because I don’t have the space to build things. Oh the things I’d build if I had space to lay out all my tools! When I do build, It is usually out of necessity (Champagne taste, meet Kool-Aid budget, hello!). I finally decided to build the table I really want, once and for all, instead of rearranging every few months in an attempt to compensate for what I didn’t have. I saw this table on Pinterest, and decided that was the one. What I loved about it was the cubby sandwich underneath the work surface. Since I would be giving up some storage in the form of the lone drawer in the kitchen cabinet, I knew I’d need some place to keep my printing necessities. I also loved the OSB surface for the industrial look. 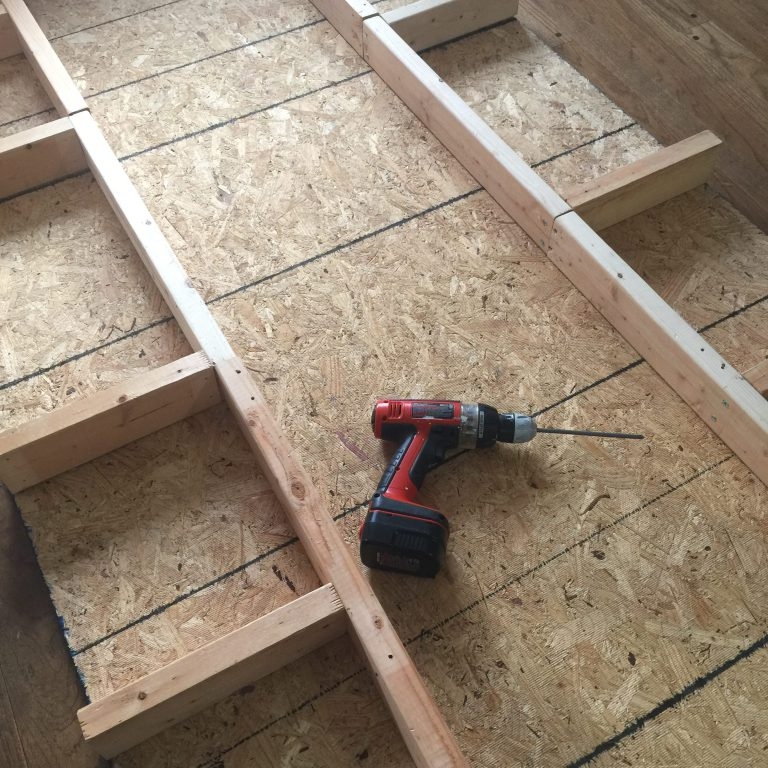 I had seen OSB used as flooring at a friend’s house and loved how clean and simple it looked. It was also shockingly smooth. I expected that it would be rough to the touch, but it really wasn’t. Plus it’s cheap, to be honest. Same table, but they built their own legs. I loved the little design detail of the tapered legs, but I didn’t think I’d be able to do all that… I figured I’d just leave the legs rectangular. The first thing I did was to get to work on the legs. 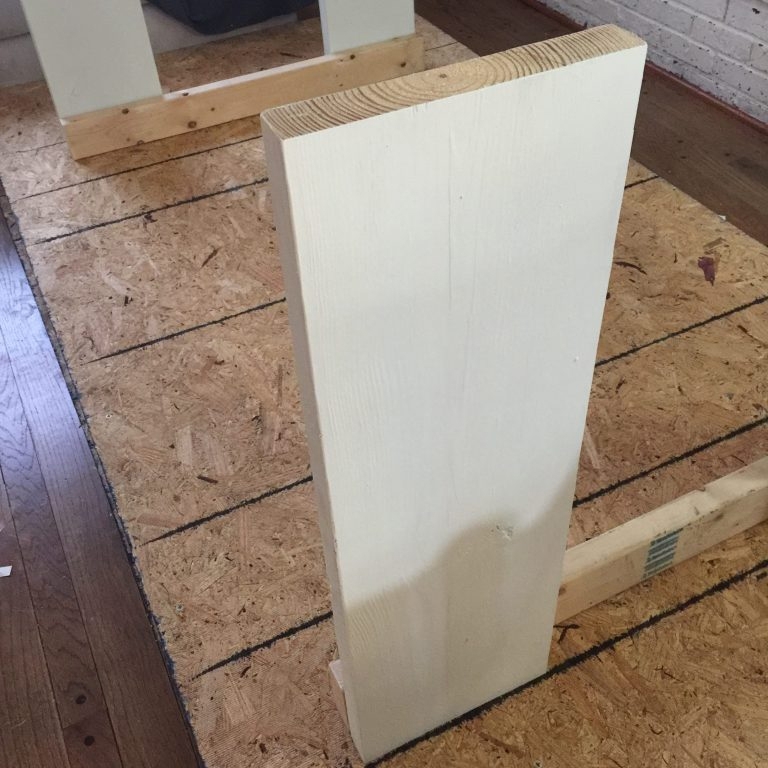 We had a whole 12ft length of 2” x10” board left over from our recent basement steps remodel. I quickly cut it down to 4 29” pieces, using my compound miter saw. SN: It’s really best to use a circular saw if your miter saw does not cut all the way through the width of the board. It’s really hard to line up the board perfectly to cut the rest from the other side. I quickly painted all sides of the legs, thinking that this assembly would come together fairly quickly, once I got the OSB. And it would’ve, if I hadn’t had several detours… A wise woman once said, ‘don’t mistake detours for shortcuts’. I had an assortment of 2 x 4s left from a variety of projects, so I thought I’d cobble those together to make the cubby sandwich part. My first attempt at the sandwich, using leftover 2x4s. The only thing left to do was to go get the 2 OSB panels. Off to Lowe’s I went. Open faced sandwich, part 1. It looked straight enough laid, but…I quickly realized how hard it is to make a cubby sandwich with so many moving parts. Even more, it’s hard to do this blindly (screwing in the pieces from the top). After much heaving and ho’ing (haha!) I had half of the sandwich made. Through my mounting panic, I knew, that crooked cubbies would be problematic if I plan to put in rectangular bins. I also know that if I didn’t correct it now, I’d be rebuilding the table in a couple of weeks. The legs were also wobbly. The example from ABM was very skimpy on details about the build, so I was guesstimating what they did. My table was also substantially larger than theirs, since I opted to use the full 4’x8’ sheets. I decided to start over, and really build properly, or live to build again. I looked at my dining table for inspiration on how the legs were attached. They were attached using the traditional ‘apron’ style, so I decided to do just that. I also suspected that I would need to make pocket holes, to have really strong joints. 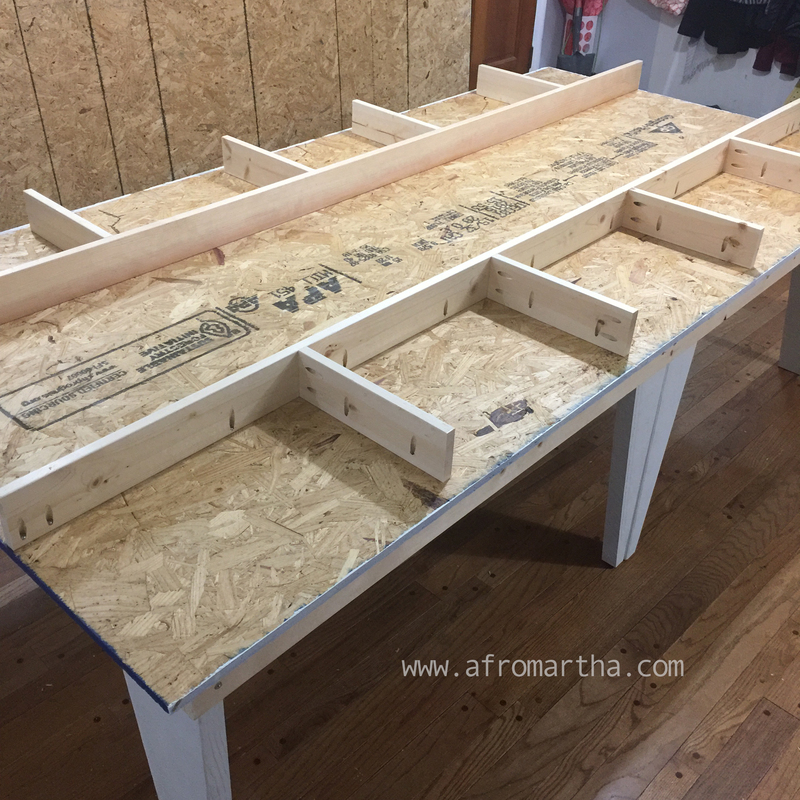 The table was wobbly because I was putting in screws on the end cap of the boards. I also realized that, I did not need to use 2×4’s for the aprons or the cubbies. The 1”x 4”s would do just fine. This also meant that the table would be not so massively heavy. So, what I set off for Lowes. Again. I went in for 1 by 4s, I came out with 1×4’s and a Kreg Jig. A Kreg Jig is a tool for making pocket holes. Pocket holes allow you to make stronger joints. This is a tool I’d been drooling over since I first saw it on Ana White’s website. Can I just say that the Kreg Jig blessed my very existence?! I mean, it made the assembly so much faster! It was definitely worth the money. The moral of the story is: use the right tools for the job! I was able to drill the pocket holes pretty quickly so that assembly went smoothly. I decided that I really wanted the tapered legs, so I got the right saw blade for my miter saw, and the cutting went really smoothly. I also decided to shorten the legs from the original 29”, down to 27”. From this point on, the assembly went pretty smoothly. I put the cubby sandwich in for in-table storage. The long channel down the middle will be used to store long items like my T-square and bolts of fabric. The smaller cubbies will hold smaller bins of items I use fairly frequently. Cubbies visible before putting the top on. One pesky detail I had to contend with, was the stamp put on by the manufacturers of the OSB panels. This stamp is put on to mark the panel in the event of theft. It makes for an unsightly mark on my table, so I ended up sanding off as much as I could. Nobody else mentioned this in their tutorial, so I assume this was not an issue for them. So, 4 days after I started, I had my beautiful new table. Completed, prior to sanding off the brand markings. Here it is, with the top sanded and waxed. So far I’m loving it! As you can see, I have wasted no time outfitting the cubbies with dollar tree plastic bins for storage in the cubbies. I also attached a curtain rod (really a 1/2″ conduit pipe) to mount a bolt fabric on when I want to cut. It is long enough to hold the bolt, a water bottle and a roll of paper towels. I know this was a lot to take in, so please feel free to email me if you have questions. Paint all the legs, unless you intend not to paint. Drill pocket holes into the aprons, cubby pieces, and leg pieces. 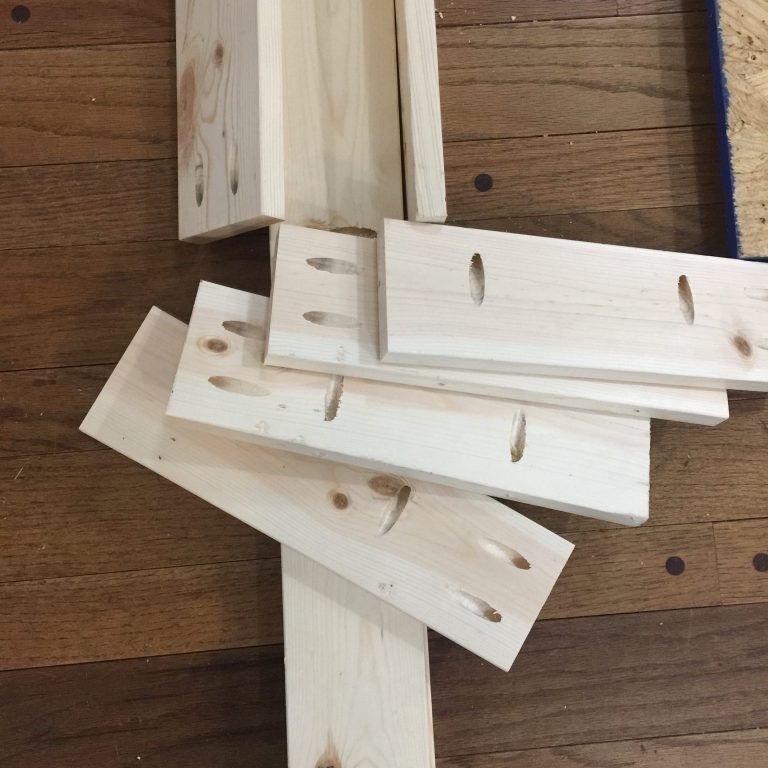 Attach the long cubby pieces to one smooth side of the OSB panel, about 12” in from each long side, using 1 ¼” pocket screws. Attach short cubby pieces to long cubby pieces, 1 per side, spacing out as desired. Flip this assembly over and attach aprons, Attach aprons to what will be the underside of your table, approximately 2” in from the edge. Attach all 4 pieces, with the shorter pieces fitting in between the longer pieces. Flip the entire assembly over, so table faces up, with cubbies exposed. 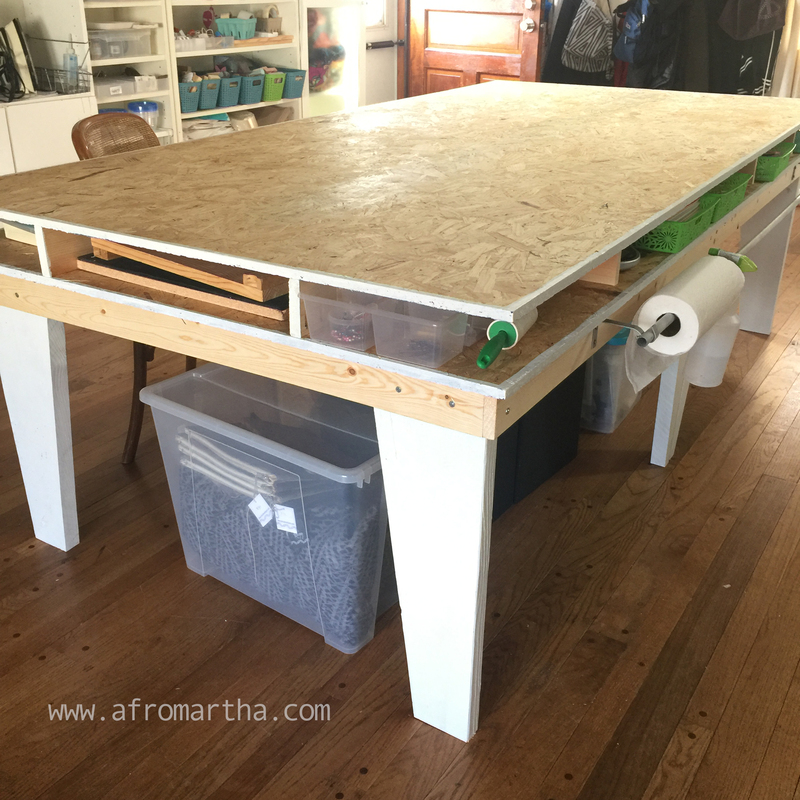 Attach the lid (2nd 4’ x 8’ piece) to the assembly. 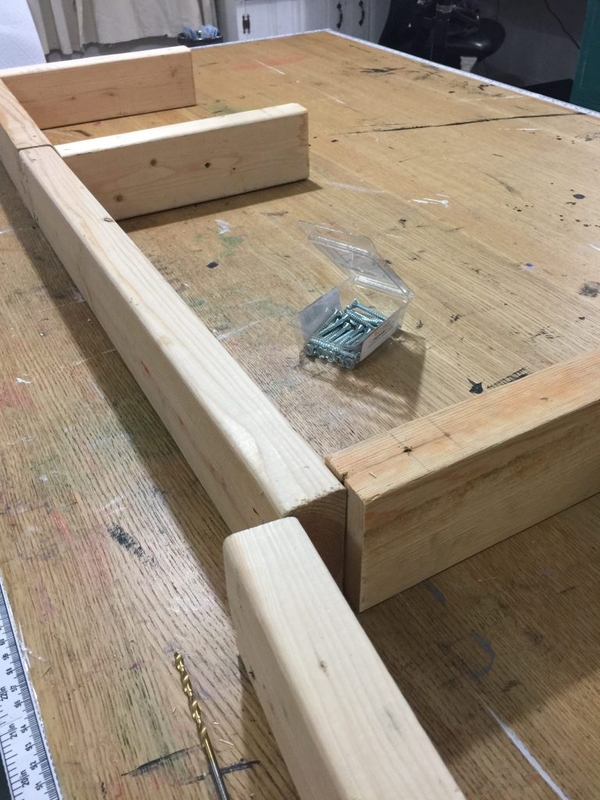 Screw in the perimeter of the table into the cubby pieces. Sand off the Stamped logo as much as possible, with the palm sander.. Give the entire table a smooth sanding. 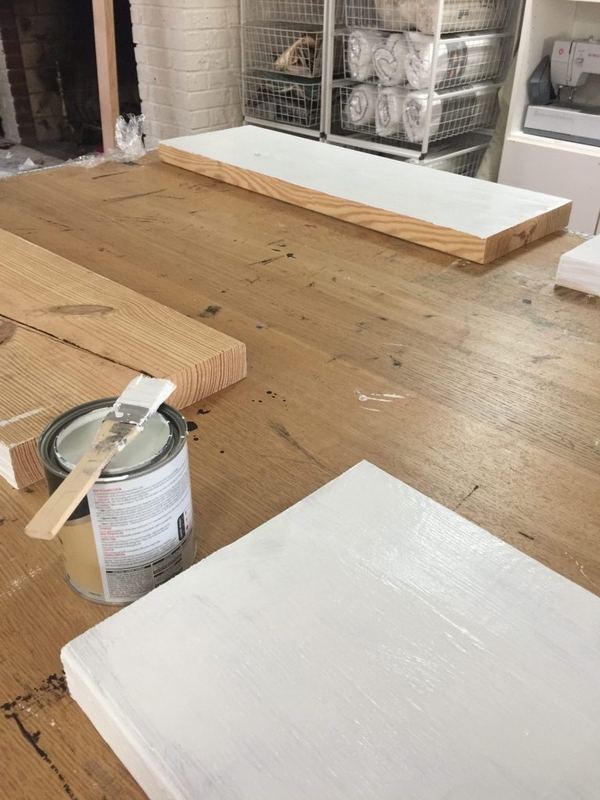 Paint the edges (mine were blue) of the OSB boards and the pine boards white and let dry. Apply wax with an old t-shirt. 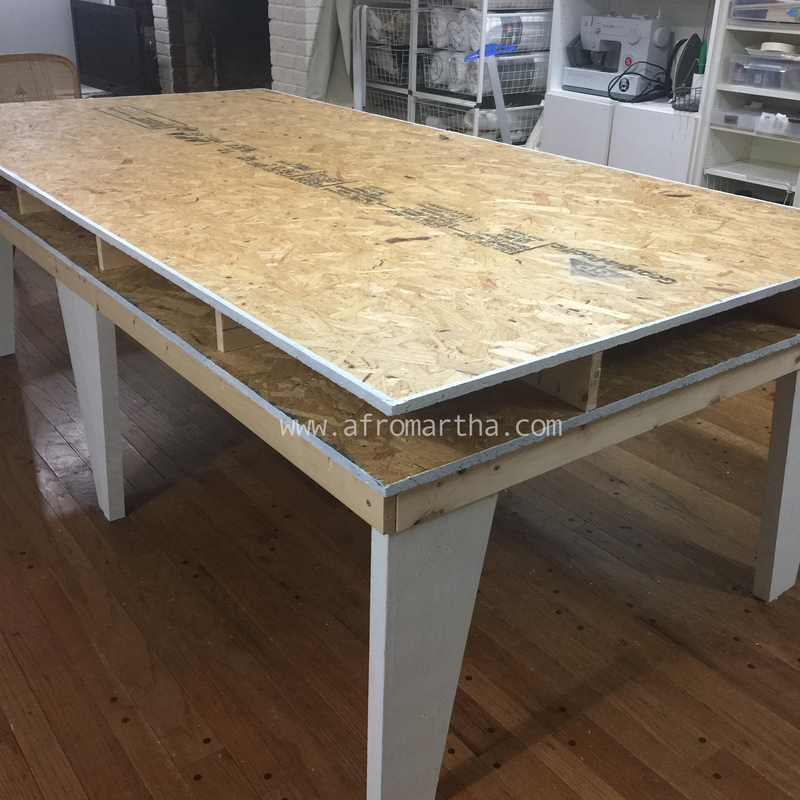 Enjoy your new work table and admire your handiwork!